2003 was an eventful year. The space shuttle Columbia exploded, Saddam Hussein was captured by UN-unsanctioned coalition forces, the Black-Eyed Peas topped music charts worldwide and Sweden was in the grip of a new thing that would soon spread all over the world: spanking the monkey! Don’t worry, I’m not going into genital humor here, other game reviewers are way more funny with that. 2003 was indeed the year when Swedish game publisher Gigantoskop released the card game Spank the Monkey. As a bunch of lowly junkyard employees, the players have to capture (and spank) a monkey that has entered the junkyard by piling up everything they can find, literally including the kitchen sink, in order to climb after the troublesome simian. Now it is 2013. The US have mostly abandoned their space program because they need the money for reading our emails, we’re as far from peace in the Middle East as ever and the music that tops the charts is still pretty horrible. 2013 is also the year when you find out that you spanked the monkey a little too thoroughly ten years ago. The poor creature died from the abuse and was buried right there on the junkyard which just so happens to have been built on top of an ancient burial site. That’s a lot of coincidences already, but the worst is yet to come: you and your fellow players are working on that one night the monkey comes back to life. And again you’ll be building towers of junk, but this time it is you trying to escape from Frankenmonkey. And if he gets you, he won’t let you off with a spanking. You start stacking junk frantically. You’re beyond fear. You’re beyond primal fear, even. You’re in *loud thunder* Primate Fear! 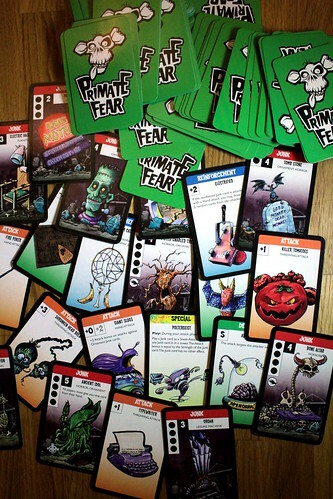 Primate Fear is not what you’d call a deep, strategic game. It’s a game about piling up junk to escape from an undead monkey, so that really shouldn’t surprise you. You pile up junk by playing junk cards, always adding them to the top of your tower and climbing up. And what wonderful junk it is, this is truly the junkyard of horrors. Sarcophagi, graveyard gates, possessed cars and even the ancient idol of Cthulhu, they are all abused for your escape. Each junk card has a height, that’s how far away from the unholy ground the card gets you, but many of them also have entertaining special abilities. For example, having the Hearse on top of your pile makes it impossible to use junk cards that do not have the Horror keyword – fortunately, there are many of those on this junkyard. Or take the Demonic Elevator that, unlike other cards, can go anywhere in your pile, not only at the top. Or the Voodoo Throne that has some limited control over Frankenmonkey. All that shiny junk, disappearing in other players’ towers, it’s enough to make one jealous, isn’t it? Well, don’t worry, you get to act on that impulse because destroying opponents’ junk piles is also a part of the game. You’ve heard the saying “I don’t have to climb faster than Frankenmonkey, just faster than the other losers working here”. That’s so much easier when you’re destroying the other towers as you go, and attack cards are what makes Primate Fear fun. Flaming Pumpkins, Holy Water, a Staking Kit, Detachable Fangs and Giant Slugs are all legal ammunition on this junkyard. Attack cards fall into three types: throwing attacks that can target any part of an enemy tower, hand attacks work only on cards at the same height as you – making them useless if you’re on the highest tower – and sneak attacks that follow their own rules printed on the cards. Playing attack cards, you roll a dice against the strength of the targeted junk card and if your roll matches or exceeds that, the card is destroyed. Most attack cards give you a bonus on that roll, too. Having a part of your tower destroyed is even worse than it sounds, because when it happens the parts above it come crashing down and may destroy themselves and the part below they hit. An unlucky chain reaction can obliterate your whole tower. But the victims are not helpless in the face of this destruction, just like there are attack cards there are defense cards modifying the die roll in their favour. On top of that, there are Reinforcement cards that permanently increase the strength of the junk card they are played on. Personally, I’m a big fan of Electrified: when anyone tries to attack the Electrified junk, he gets zapped and I draw two cards from him. But there is all sorts of stuff to use as Reinforcements, too, from Rattling Chains to Gothic Architecture – a Gothic Possessed Car would be a movie prop to draw me to the theater – to really odd special effects like The Picture of Dorian Grey. Now who threw that away, I wonder? And the really cool part with all those cards is that they feature great illustrations that most horror movie fans will recognize, either as a generic prop – like the abandoned cabin – or in a more specific way: the Typewriter is depicted as writing “All work and no play makes Jack a dull boy”. Call me a nerd, but I love this sort of details in my games. What is still missing at this point is Frankenmonkey. He’s the reason we go to all that trouble, after all. Some cards show a monkey paw icon. When one of those is played, one rotting piece of the undead monkey is added to the oversized monkey tableau. 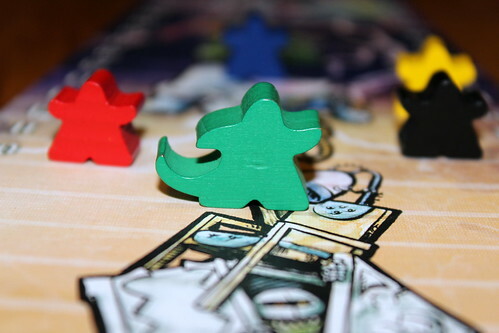 Once he is assembled, he starts climbing: Frankenmeeply – that’s right, there’s a monkey meeple! – moves one step up on the Climbing Height Board after each players turn, and one more step for each monkey paw that is played now. It’s obvious a monkey can climb quickly, isn’t it? Any player meeple he overtakes on the way is captured, spanked, ripped to pieces, spanked again and finally eliminated from the game. That is one angry monkey. We usually don’t look kindly on games with player elimination, but Primate Fear is usually pretty quick, and once Frankenmonkey is ALIIIIIIIIIVE!!!! players tend to be eaten quickly enough. Except for the last one of course, he’s the winner. If you can call it winning, sitting on a tower of horror movie junk, having survived the horrors of being attacked by an undead monkey, looking down on the mutilated corpses of former friends and colleagues. Lets say he’s the survivor. You also get to survive if you manage to climb up to level 25 on the Climbing Height Board. But honestly, if you manage that, you need meaner friends. Now I warned you in advance, depth is not what Primate Fear is about. Of course not, it’s about height, if you’ll excuse the pun. Seriously though, this is a game to have fun with, enjoy the wacky cards and throw your friends to the wolves – sorry, the monkey. There’s a lot of take-that and schadenfreude, some little tactics in how you use your cards and a good dash of genre humor – a very nice little game if you’re into this sort of thing. We sure were. Every year Fragor Games releases one game, designed by the Lamont brothers and produced with ridiculously pretty ceramic miniatures. Last year, that game was A Game of Gnomes. It’s what it says on the box: a game, and about gnomes. Except the title and some puns in the rule book, it has nothing to do with that other A Game of …. Something that everyone is talking about, but it has a lot to do with mushrooms. And it has the largest single component in any game we have here at the Meeple Cave. A very short game, with rules that can be explained in about two minutes, materials you can carry in your coat pocket that still manages to look good and offers some depth? It does exist, and it’s called Linja. Age of Thieves is not a game about collecting victory points or anything mundane like that. It is about nothing less but fleeing a city under a full-fledged state of alarm – with guards roaming the streets and alleys – while casually carrying the most valuable jewels you can out of the city. What comes out when you take two popular games, add some dashes of more games, and then run that mix through a cocktail shaker? That’s what Friedemann Friese wanted to know when he created Copycat from odds and ends of the Top Ten games on BoardGameGeek. And what came out … well, read for yourself. Sometimes, game expansion are best when they change nothing at all. If it ain’t broken, don’t fix it, as they say. Is this nugget of wisdom true for Dixit 2? A game as old as bone. It’s not an expression I get to use a lot, since we review the newest games we can find. But in the case of Oss, it’s not wrong, because Oss is based on the old, old game of Jacks. The game where you throw sheep bones in the air and pick up other sheep bones before you catch the first one again. But don’t worry, Oss is the more hygienic variant of that, and you don’t have to worry about being haunted by ovine spirits, either. Another trip up the world’s highest mountain, this time with a questionable travel ageny. After all, they must have known the storm was coming and could kill some clients. But you, the heroic guide on the mountain, will try to keep them alive – and still get them up the mountain so the agency doesn’t fire you. Good luck.